Photographer Adrian Fisk traveled 2,700 kilometers across China and India to discover that most young people are, in essence, exactly the same. 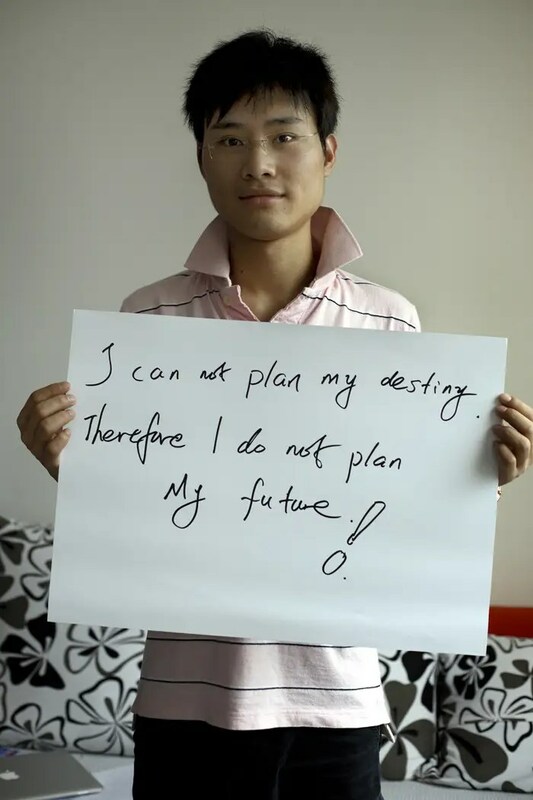 While living in India, Fisk realized he knew nothing about young people in the nearby country of China, and neither did anyone else in India. Fisk dug deeper into the subject and came across the staggering fact that there are 1.2 billion people between the ages of 16 and 30 years old in China and India. Fisk wanted his project to be a voice for these young people that the rest of the world knew little about. 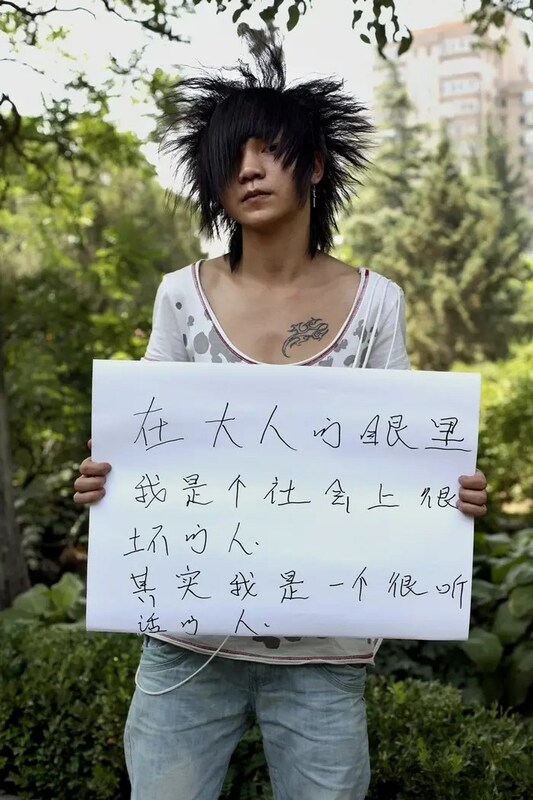 He started his photo project “iSpeak” in China in 2008. 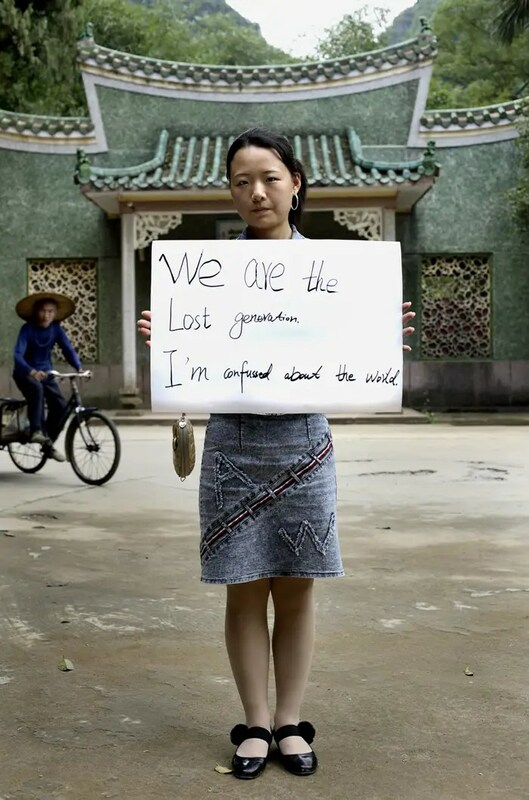 The project consists of portraits of Chinese men and women between the ages of 16 and 30 in their natural environments. Each would hold up a white sign on which they would write a message expressing their worldviews or desires. In 2010, Fisk expanded the iSpeak project to India. In the meantime, the project went viral back in China as blogs and major media outlets started discussing its significance. The United Nations Population Fund is now supporting the project, which will be called iSpeak Global. Fisk hopes to expand to 25 countries, starting in Africa next. The 25 countries are all relevant to the 21st century in political, economical and social ways and when the project is completed, the exhibition will go on tour. There are also plans to publish a book with all of the portraits. Currently, Fisk is in London seeking additional fundraising from companies for the continuation of the project. He has been kind enough to share some images with us, but be sure to check out the full collection at AdrianFisk.com. As Fisk traveled 1,200 kilometers across the China during a 30-day period with a translator in tow, he randomly selected people he saw on the streets, on farms, or seated next to him at a cafe, and asked them to be part of his project. The answer was typically: “China’s a great country and I want to be rich.” This was an unacceptable answer to Fisk, because all 1.2 billion people would respond that way. Sometimes these conversations would last two hours, and once the subject’s mind was buzzing, they’d have a truly original thought to write down. “It just goes to show how increasingly materialistic and consumer driven China is,” Fisk said. During his journey, Fisk came across illiterate people who couldn’t write for themselves, but still had something to share. He dealt with this challenge by asking those people to hold up blank posters, which made for an “even more powerful political message,” Fisk said. Then, Fisk wrote down what they wanted to say for his captions and included them in the project that way. As Fisk finished his project, he reflected on the trust he built with his subjects. He referred to himself as a “strange white bloke” who came up to them, tapped them on their shoulder and asked about their inner most thoughts. Alex Li, 22. Student international economic trading. Guangdong Province. Avril Lui, 22. Post-grad student. Guangxi Province. 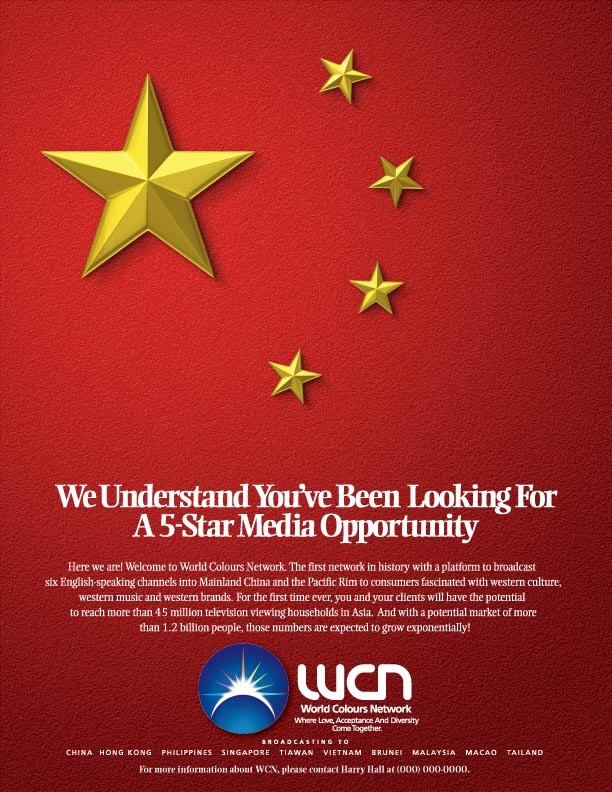 WCN Transmedia Group celebrates the efforts of Alicia Keys. A true inspiration, Alicia is demonstrating the true power of Celebrity. Beyond the glitch and glamour here is a women making a difference in the lives of children. WCN joins her efforts and ask you now to support through your donation, your time, your prayers for this movement to empower the treatment for life, as to join her call to end AIDS. Please take a moment to hear Alicia for yourself. Here her call and determine if you can be the Agent of Change for the World. WCN will display this UPDOCDE Logo to connect your directly to Keep A Child Alive Donation Website. There is a profound difference between living and life. Living may extend time for another day. But life is far more than sleeping and waking. Anti-retroviral therapy (ART) has transformed the lives of people with AIDS in the West, returning them from sickness to health. But only 33% of the 15 million people who so desperately need treatment, have access to it. 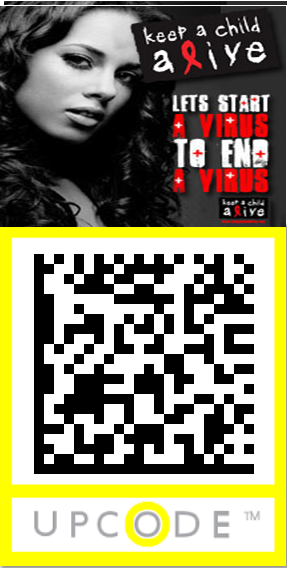 When children are infected, 50% die before the age of 2 and 80% die before the age of 5. Keep a Child Alive provides first class AIDS care through doctors, nutrition, testing, transportation, and treatment for opportunistic infections, which are all necessary for anti-retroviral treatment to be successful. KCA also provides the care and support to keep orphaned and abandoned children safe. 16.6 million children have lost their parents to AIDS. These children will face enormous risks in their struggle to stay alive. They will often be forced into sexual exploitation or enrolled as child soldiers. Keep a Child Alive supports the children’s extended family caregivers, and builds and sustains orphanages to keep the most vulnerable children out of harm’s way. Through documentary films and ground-breaking media campaigns, Keep a Child Alive directly engages the global public in the fight against AIDS. We actively work to educate people about the emergency issues of AIDS in Africa and India in an effort to re-invent the way they perceive their role in being part of the solution. On the day of the Royal Wedding the one shoe mentioned more than any other has been Jimmy Choo. Today must be a great day for Professor Choo and the Jimmy Choo Brand. Dato’ Jimmy Choo OBE, born Choo Yeang Keat, (Chinese: 周仰杰)  is a Malaysian fashion designer based in London, United Kingdom. He is best known for founding Jimmy Choo Ltd that became known for its hand-made women’s shoes. Choo was born in Penang, Malaysia into a family of shoemakers. He is of Chinese Hakka  descent. He made his first shoe when he was 11 years old. He is perhaps the most notable of students of Cordwainers Technical College in Hackney from which he graduated in 1983. (The college is now part of the London College of Fashion.) Choo has divulged that he worked part-time at restaurants and as a cleaner at a shoe factory to help fund his college education. Jimmy Choo’s beginnings can be traced back to his workshop in Hackney, North London, which he opened in 1986 by renting an old hospital building. His craftsmanship and designs were soon noticed and he came to the verge of international notability when his creations were featured in a record eight pages in a 1988 issue of Vogue magazine. Patronage from Diana, Princess of Wales from 1990 onwards further boosted his image. In April 2001, Choo sold his 50% stake in the company for £10 million. He has since been concentrating his work on the exclusive Jimmy Choo Couture line produced under license from Jimmy Choo Ltd. The Jimmy Choo London line, also known as Jimmy Choo Ready-To-Wear or, simply, Jimmy Choo, is under the purview of Tamara Mellon. The ready-to-wear line has expanded to include accessories such as handbags. Choo lives in London. He is currently involved in a project to set up a shoemaking institute in Malaysia, where his iconic status is often evoked to inspire budding shoemakers and fashion designers. His company Jimmy Choo Ltd. produces some of the most expensive high-end shoes. Choo’s son is IT entrepreneur Danny Choo. Danny Choo, Jimmy Choo’s son, also a part-time shoe designer. Liverpool in 2011, bigger and better than ever. Due to the unprecedented success of Africa Oyé 2010 and the ever increasing number of attendees to the Festival on an Annual basis (2011 being Oyé’s 20th anniversary), Africa Oyé will be a ticketed Event from 2011. This new development has been put in place to safeguard the future of the festival, and to consider the interests and safety of all visitors to the event. of Oyé make it impossible to continue to keep it Free. We are delighted to announce that Africa Oyé has been selected by Songlines as one of the top 10 UK summer festivals. If you would like to trade at Africa Oyé 2011 there are a limited number of spaces left.